WASHINGTON — House Speaker John Boehner called on President Barack Obama on Wednesday to deliver a specific rationale for using U.S. military force against Syria as a growing number of congressional Republicans and Democrats expressed concerns about war with a Mideast nation roiled by civil conflict. In a letter to the president, the Ohio Republican underscored that he has been supportive of administration policy to date as Obama has called for Syrian President Bashar Assad to resign and insisted that the use of deadly chemical weapons would be a gross violation of international norms. The administration signaled Wednesday that it would act against the Syrian government even without the backing of allies or the United Nations in response to the alleged chemical weapons attack outside the Syrian capital last week. The United States has not presented proof publicly, but Obama said his administration has concluded that the Assad government carried out the large-scale attack on civilians. Obama said he had not made a decision about how the United States would respond. The administration was planning a teleconference briefing Thursday on Syria for leaders of the House and Senate and national security committees, U.S. officials and congressional aides said. The speaker also pressed the president to provide a legal justification for any U.S. military action. 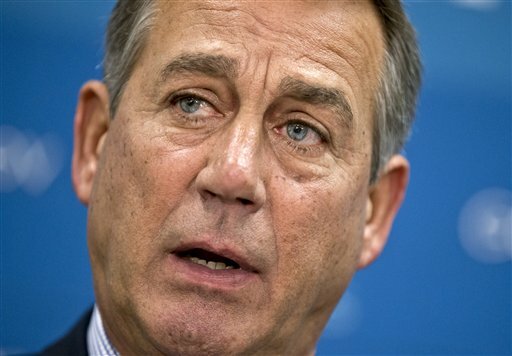 There was no immediate reaction from the White House to Boehner’s request. In the House, 98 Republicans and 18 Democrats have signed a letter to Obama demanding that he seek congressional authorization for any military action against Syria. The letter written by Rep. Scott Rigell, R-Va., argues that intervention without a direct threat to the United States and without Congress’ approval would be unconstitutional. Washington Rep. Adam Smith, the top Democrat on the House Armed Services Committee, cautioned that an attack might be ineffective and draw the United States into the Syrian civil war, now in its third year. “Simply lashing out with military force under the banner of ‘doing something’ will not secure our interests in Syria,” Smith said in a statement. Oklahoma Sen. Jim Inhofe, the top Republican on the Senate Armed Services Committee, said he informed the administration that he could not support any military strike against Syria unless Obama presents a detailed strategy to Congress and provides a defense budget to support any action. An increasing number of Republicans and Democrats insist that Congress should have a vote on whether to authorize any military steps against Syria, dismissing the notion that the commander in chief can act unilaterally and ignoring Congress’ constitutional power to declare war. “The war in Syria has no clear national security connection to the United States and victory by either side will not necessarily bring in to power people friendly to the United States,” Sen. Rand Paul, R-Ky., said. In his letter, Boehner raised 14 questions that he asked Obama to answer, including what the administration would do if Syria retaliates against U.S. allies in the region, whether the administration would launch additional military strikes if the initial ones proved ineffective and what was the intended effect of such a step. Boehner alluded to the 10-plus years of fighting in the aftermath of the Sept. 11, 2001, terror attacks and the need for the administration to have strong public and congressional support for U.S. involvement in a Mideast war. “Our military, as well as their families, deserve to have the confidence that we collectively have their backs — and a thorough strategy in place,” the speaker wrote.